"Top moist carrot cake cupcakes with bright and citrusy lemon frosting for a delectable spring treat." Preheat oven to 350 degrees F. Line muffin pans with 24 Reynolds(R) StayBrite(R) Baking Cups. The best party accessory is a matching dessert! Reynolds StayBrite Baking cups and these yummy cupcakes are sure to amp up any party. The colors of the baking cups won't fade making your dessert the best on the block! 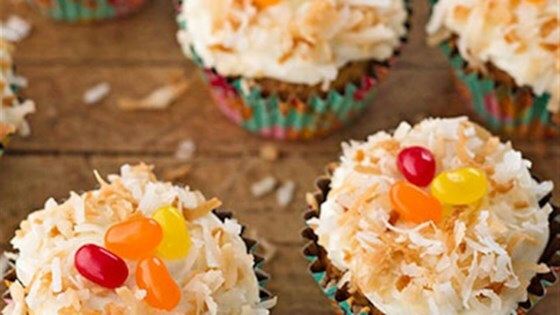 Delicious, these are very good, made them for easter and colored some of the coconut...big hit!